(St. James) Twenty Water Protectors brought construction of the Bayou Bridge pipeline to a halt this morning in St. James Parish, an area where the pipeline company is currently under a judge’s orders to stop construction. Bayou Bridge LLC has defied Judge Alvin Turner’s order to halt construction, not only continuing construction in the fragile coastal zone but accelerating it. Water Protectors intervened today to enforce the law that the Louisiana Department of Natural Resources is failing to enforce. 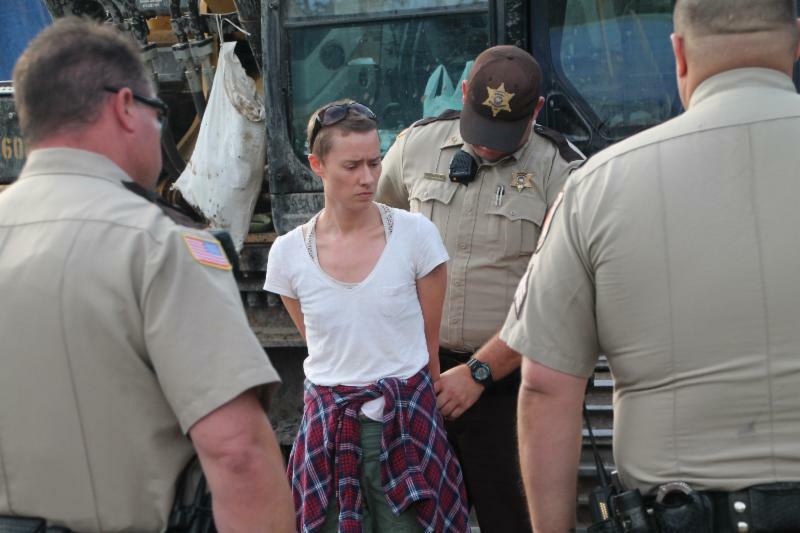 Two women were arrested at the site. “St. James residents haven’t been listened to,” said Alicia Cooke, a Water Protector with 350 New Orleans who was arrested in this morning’s civil disobedience. “We’ve been fighting this pipeline on every level through every legal means for over a year. I’m not sure how many more ways Louisianans can say we don’t want this or need this. Our bodies are on the line, because that’s all we have left.” A video of the morning’s events is available here. The Water Protectors walked on site amidst bulldozers and heavy equipment, which workers immediately brought to a halt. The pipeline is visible on the site, where trees have been cleared, a 20 foot wide trench dug and much of the pipeline laid. The Bayou Bridge Pipeline is being dug right through this coastal zone, a contradiction of the government’s and even the oil industry’s stated urgency to protect the coast. In his April 30th decision, Judge Turner noted the risk to the St. James community from the pipeline. Water Protectors monitoring construction have cited numerous permit violations which have been communicated to the Department of Natural Resources (photographs available on the Louisiana Water Protector Facebook page). The department has thus far failed to take any action beyond retroactively modifying the permit to make Bayou Bridge’s activities legal. The women arrested today were charged with trespass on an immovable structure and released mid-morning. The action is part of a long running civil disobedience campaign to stop construction of the pipeline, action taken because of the state’s failure to enforce the law. Today’s arrests come after two events this week in which Judge Turner’s order were delivered to relevant parties, including the Louisiana Department of Natural Resources and Bayou Bridge site supervisors in St. James. The community of St. James is burdened with the highest concentration of crude oil pipeline disasters in the State of Louisiana, according to Pipeline and Hazardous Materials Safety Administration data. The National Response Center data, including self reports by industry, detailed 37 accidents in a 14 month period in St. James Parish. According to a recent report by Greenpeace and Waterkeeper Alliance, Energy Transfer Partners averages an accident or oil spill every eleven days. ENERGY TRANSFER PARTNERS KELSY WARREN IS THE DEVIL INCARNATE. HE IS THE ONE WHO BULLDOZED AND CONTINUED TO DESTROY STANDING ROCK FOR HIS OIL PIPELINE (DAPL). HE BROUGHT IN MERCENARIES AND PAID OFF THE CRRUPT North Dakota GOVERNMENT TO ALLOW HIM TO CONTINUE. OVER 400 NATIVE AMERICANS AND THEIR SUPPORTERS WERE ARRESTED AND SENT TO JAIL. ONE Native American WAS STRIPPED AND HELD BY THE SHERIFF NAKID ALL NIGHT IN JAIL. MANY WERE MAIMED BY THE MERCENARIES. JUDGES SET RULINGS FOR STOPPING THE DESTROYING OF THE SACRED BURIAL SIGHTS AND THE PROPERTY BUT HE TOTALLY IGNORED IT. #45 ALLOWED IT TO RESTART THE DAY AFTER HE BECAME PRESIDENT. The pipeline developers and the fossil fuel industry believe they are above the law and are behaving as if they are in Virginia too. We have to decide whether they are right or not. We stand with you in choosing not. I STAND WITH ALL WATER PROTECTORS IN MY HEART!!! If the judges, law enforcement, public “officials” are NOT going to hold this ILLEGAL COMPANY to the judge’s orders, then its left only to the water protectors, who, in my opinion, do not DESERVE to be ticketed with CIVIL DISOBEDIENCE. The NOTORIOUS INFAOUS PIPELINE COMPANY is the one doing an illegal act here by violating JUDGES RULING, the water protectors are merely doing the job of those PAID TO PROTECT & SERVE THE PEOPLE, not the PIPELINE Co. ETP, havent you learned anything from your heinous acts committed by your company & TIGER SWAN who still faces WORKING UNLICENSED in the state? Apparently not…….well, although we water protectors are harmless and peaceful, we are a FORCE TO BE RECKONED WITH, Dont u know thata by now?…………..NO ONE IS ABOVE THE LAW. GO ASK YOUR PRESIDENT!!!! Why don’t they get served via the sheriff? What a Judge rules is final here in the UK, and so it should be in the US. It makes me think the police force are being paid off by the companies.